Black Ops 2 And Halo 4 Have Been Leaked, But Stealing Is Still Bad. Whenever a new video game is about to hit the market, it's pretty safe to assume that a few clever little pirates will devise some new and exciting way to play the title a few days before its release. Last year, several copies of Modern Warfare 3 found their way into the open market, but Activision mobilized a slew of investigators to (literally) knock on their doors and kindly threaten them with a $5000 fine. I'm assuming that a fair amount of judgmental finger-waving was also involved, but this can neither be confirmed nor denied. Well, as unsurprising as this news may be, Halo 4 and Black Ops 2 have found their way onto several popular torrent sites, and the number of downloads is steadily increasing on both titles. A version of Microsoft's latest chapter in the Halo franchise hit torrent sites early last month, and the publisher has been doling out a steady stream of Xbox LIVE bans ever since. Shortly after installing the game, pirates receive a sternly worded email from Microsoft letting them know that they've been busted. "This email is to notify you that your Xbox LIVE privileges have been permanently suspended due to illegitimate prerelease title play," the email reads. 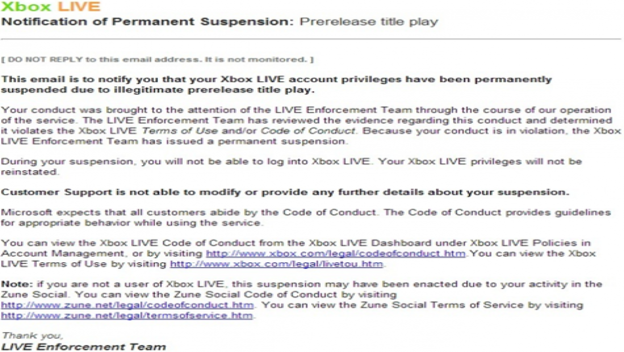 "Because your conduct is in violation, the Xbox LIVE Enforcement Team has issued a permanent suspension." There's no word on how many bans Microsoft has handed out thus far, but thousands of people have already downloaded the title, so we can probably assume that the number is growing. 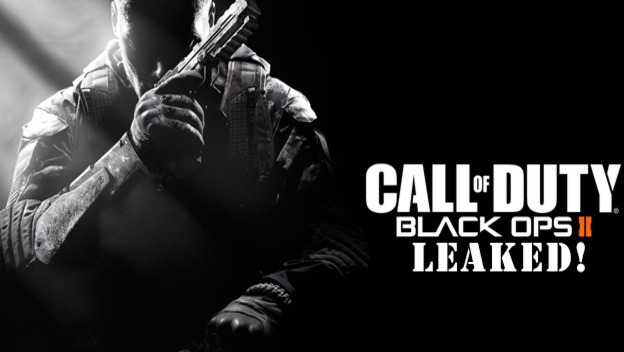 As if a leaked version of one blockbuster wasn't enough, Black Ops 2 made its way onto the Internet over the weekend. What's interesting about this leak is that several particularly ballsy/stupid pirates have been live-streaming their gameplay, which quickly caught the attention of the development team at Treyarch. David Vonderhaar, Treyarch's Game Design Director and the man behind the BO2 multiplayer experience, tweeted "If you are going to live-stream the game early, which I don't remotely recommend, you could at least be good at it. :P."
Activision and Microsoft are investigating the issue, but with Black Ops 2 slated for release on the 13th, it's probably going to be difficult to reign in the offenders. I'll never really understand the mindset it takes to risk a permanent ban in order to play a game a few days early. I'm looking forward to Black Ops 2 as much as the next guy, but I have enough self-control to wait until the game is officially released before I play it. After all, I'd rather wait a week than buy a new Xbox 360. But that's just me. You might say that some people have a silly, self-important, Robin Hood mentality when it comes to gaming. But in actuality, they can't help themselves because teenagers have no impulse control. Many of you may remember that Microsoft banned nearly 1 million players in 2009—just before the release of Modern Warfare 2. So, unless you have a large cache of free Xboxes lying around, you’re just setting yourself up to give Microsoft even more of your money. Robin Hood would be very disappointed. Now, if you'll excuse me, I'm going to eat a sleeve of Oreos and drink a liter of Pepsi, while I write more judgmental articles about peoples’ lack of self-control.